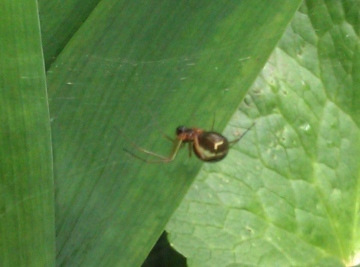 This is a money spider, probably one of the Linyphia or closely related species. This is probably Tetragnatha extensa, but Tetragnatha can't be reliably identified without adults under a microscope.
. Small spider, body is black and white though it looks green and white in the pic. Taken yesterday. Postcode is TS26 8NH. found this on irises in my pond in Hartlepool, co Durham. Is it an extensa? Taken yesterday, postcode TS26 8NH. 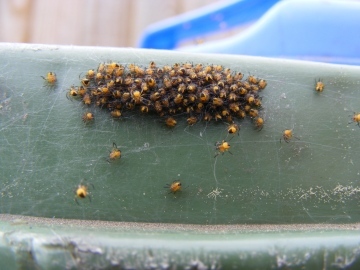 Yes, probably Araneus diadematus spiderlings, but most orb web species have spiderlings which look the same, so it is an assumption that they are likely to be this species. Araneus Diadematus? On the wheely bin which made recycling a bit tricky for a couple of days? 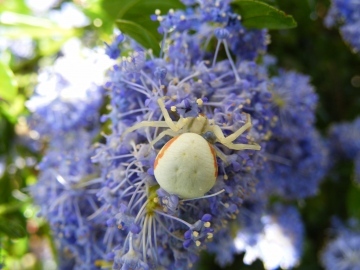 This is one of the colour varieties of the crab spider Misumena vatia. Can you provide a full postcode or Ordnance Survey grid reference please, as requested above. Many thanks PS: First time I have used this site so hope I have got the format correct. Your possible false widow is Amaurobius similis, a widespread spider of walls, eaves, fences etc in or near buildings. It is completely harmless to humans. http://www.arachnida.org.uk/# Hi, Im new to this site and after finding this spider on the bedroom this morning my other half thinks we need to worry. Can you please advise if it is a fake widow and reassure him that they are placid and not going to eat him in his sleep lol. I safely used a glass and some card and released it into the fells at the back of the house. 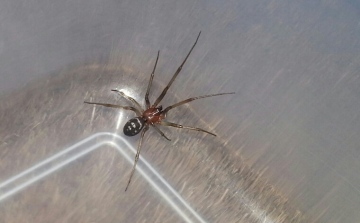 This is a male Steatoda grossa (see e.g. Nik Nimbus' photo at Steatoda grossa male. 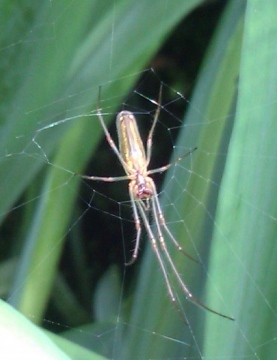 Ultimately spider identification depends on microscopical examination of the adult male and female palp and epigyne, but a proportion can usually be done from pattern and other features visible without a microscope (although enormous care is needed not to make assumptions which result in misidentifications and bad and misleading data). Steatoda nobilis and grossa usually (but not always) fall into the category where identification can be made from pattern. 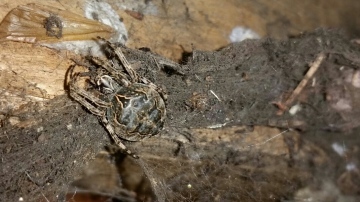 Both sexes of S. nobilis usually have a similar abdominal pattern as shown in photographs on this website for the species, with a well-marked example at Steatoda nobilis image, with males usually smaller and adults with the complex palp structure of an adult male. Some Steatoda nobilis females can have hardly any pattern at all, in which case, microscopical examination of the adult is the only way to be sure of identification. S. grossa males and juveniles have a pattern of white markings similar to those in your photo. Adult females usually have no visible pattern. Yes, that looks good for Larinioides sclopetarius. Can you provide an Ordnance Survey grid reference and actual date for your record please. You can find grid references on the Locate page (grid reference of cursor is shown underneath the map and you can click on a point). We only need a 6 figure (100m square) grid reference, but the map shows a 10 figure.